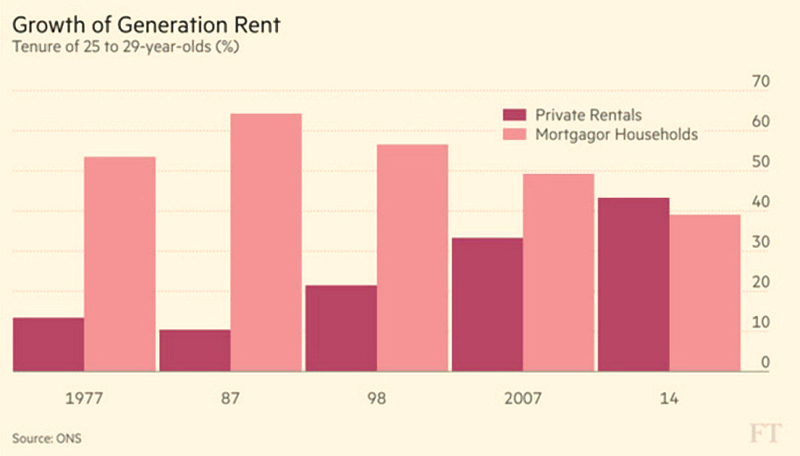 Emily Cadman looked at the switch from buying to renting in people under 30 over the past 40 years. Back in 1977 only 13% of 25- to 29-year-olds rented and 54% had a mortgage. Now the figures are 43% and 39% respectively. Most of the change has happened over the past 15 years – even in 1998, there were more than twice as many buyers as renters. There has been a similar but weaker trend for everyone under the age of 40, whilst the over 70s have gone from less than half owning their homes outright (without a mortgage) in 1977 to more than 70% doing so now. Some of this is down to high property prices and lack of supply, but the real culprit is the tightening of lending criteria. With the national ratio of prices to incomes at 5.7, and at almost 10 in London, young people can’t borrow enough money to buy. Rents are also high and business leaders worry that at some point young people will leave the capital. It hasn’t happened yet, and regional vacancies remain harder to fill that those in London. In related news, the Economist reported on an upcoming vote in the Cornwall town of St Ives. The town is about to vote on whether all new housing should be restricted to principal residences only. It’s a good headline, but a bit of digging gives some perspective. First, I should declare an interest – I go to St Ives every year and plan to buy a cottage there. Now for the perspective – tt’s only new housing that is being reviewed. St Ives is an ex-fishing village and the most popular properties are eighteenth-century fisherman’s cottages in cobbled lanes close to the beaches. There’s no new building going on in this area as far as I can see. Locals live up the hill, and that’s where new builds would be. So I don’t see what the new rule would achieve. I don’t want to buy a mile away from the sea. Also, the town depends almost entirely on tourism for income. The cottages I rent are filled for 40 weeks of the year, each week with a family spending at holiday rates. Getting rid of the tourists would kill the town. So they may vote to restrict the usage of new builds, but they aren’t voting to kick out holidaymakers. 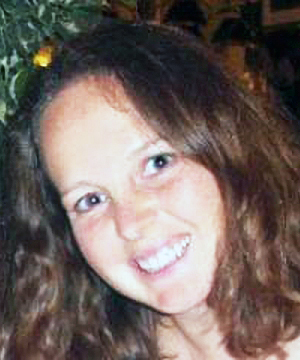 The big story of the week was tax evasion. The release of the “Panama Papers” has got people talking about offshore tax-havens. 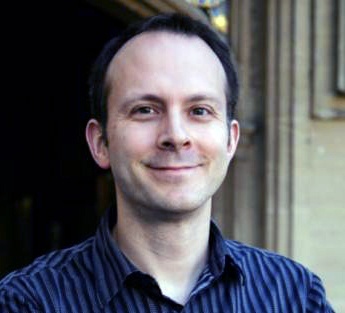 his mother has given him £200K of potentially exempt inheritance. I’ve talked before about where I stand on tax avoidance, but to be clear this all looks like standard tax planning to me, and I don’t see the issue. Nobody needs to pay more tax than the rules allow. The Economist looked at the bigger picture. The real story is of dubious politicians (not from the UK) moving very large amounts of money (billions of dollars in some cases) through secretive offshore firms. The threat to Western democracy at the moment seems to amount to the resignation of the Icelandic PM. Though Jackie Chan and Lionel Messi are also implicated. Corruption is a bad thing, politicians stealing from their electorates is a bad thing, secrecy about the ownership of companies is a bad thing. But didn’t we know all that last week? Countries like Panama have a lot to lose by moving towards transparency. How do we plan to persuade them? The story was so big that Tim Harford had an extra column in the FT to discuss both it and the US tax-inversion reforms that scuppered the Pfizer / Allergan merger (more on that later). Tim felt that public shaming was not the way to get on top of tax evasion. The biggest problem in the UK is VAT fraud, and that requires no offshore shelters. Tim’s solution was to lower tax rates, broaden the tax base and eliminate loopholes and exemptions. Unfortunately, global cooperation would be needed to make this succeed, and it is unlikely to be forthcoming. Finally on this topic, if you suddenly feel the need to construct your own web of offshore shell companies, Micheal Stothard in the FT had a do-it-yourself guide. Tim’s regular column was about coffee cup sizes. Marks and Spencer have taken away their small and large coffees (as well as teas and hot chocolates), leaving only medium (which they say was the most popular anyway. Tim’s immediate problem was that a medium hot chocolate had too much sugar for his young daughter to cope with – he used to buy her a small. Economically speaking, M&S could have been working on the principle that too much choice paralyses consumers (the famous “flavours of jam” experiment that Tim covered years ago). But that study has proved difficult to replicate, and a successful business like Starbucks offer around 100,000 possible drink combinations. With three options, people choose the middle one. This is why Starbucks doesn’t list its 8oz drinks, which need to be requested. With clever positioning, a 16oz coffee can seem like the normal size. 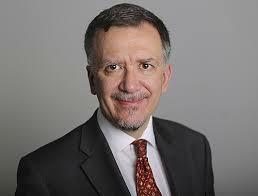 The second big tax story of the week was the decision by the Obama administration to crack down on tax inversions. These are takeovers that involve a US firm moving to the domicile of the company they are taking over, in order to save tax. Two days after the change, the $160 bn takeover (the third biggest ever) of Ireland’s Allergan by Pfizer was called off. $13 bn was wiped off Allergan’s value. The real problem is that the US tax system hasn’t been updated to reflect globalisation, and the US corporate tax rate is far too high (39%, compared to 25% for other rich countries, and 12.5% in Ireland). 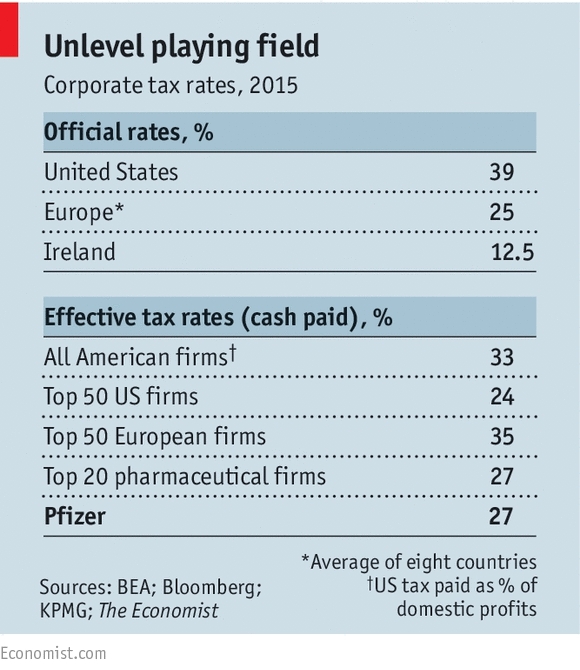 The actual tax paid by American firms is 33%, and the 50 largest firms average only 24%. Pfizer paid 27% last year, and Apple only 18%. The biggest 50 European firms paid 35%. US firms spend a lot of time making sure profits are booked to low-tax jurisdictions. And they don’t bring cash back to the US, as it is only taxed when it enters the country. There is now $2 trn parked overseas. Pfizer’s share is $80 bn, Apple’s is $92 bn. Tax inversions were the obvious conclusion: buy a foreign firm in a low-tax country and move the money there. Then the cash can be paid out to shareholders. There have been more than 20 deals in the last four years. The US corporate tax rate should be cut to 25%, and charged only on US profits. And will require the victorious candidate to be more reasonable than seems likely at present. Apart from tax, the big issue of the week was jobs. Tata Steel plans to close its UK plants unless a buyer can be found, with 15,000 jobs at stake. 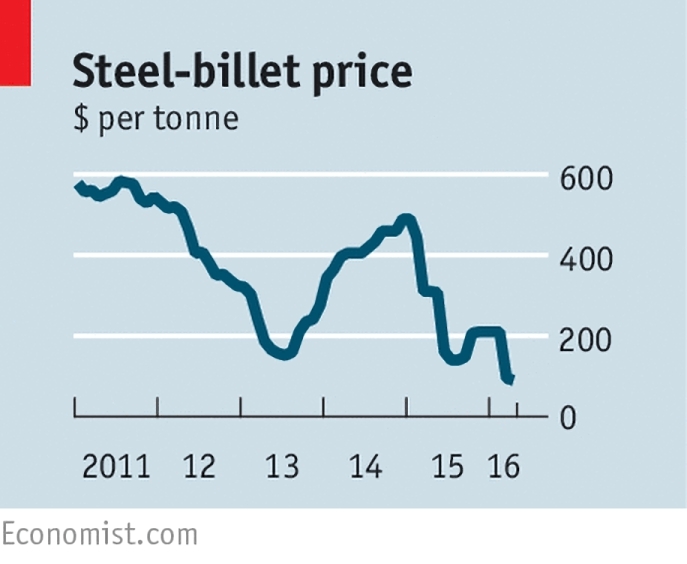 There is a global glut of steel, and prices have fallen significantly. Global output was 1.6 bn tonnes, of which the UK made 11M tonnes (around 0.7%). 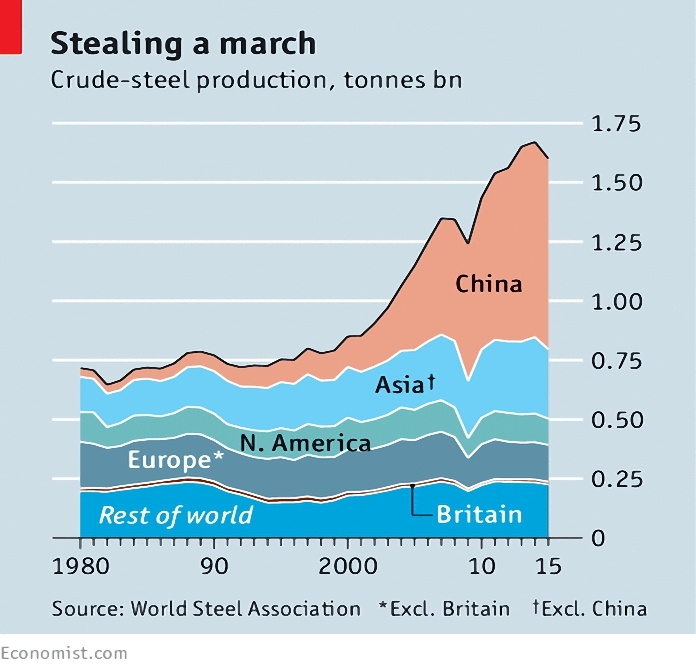 China has produced more steel in the last two years than Britain has produced since 1900. It’s true that the UK plants pay more for electricity than their competitors, but electricity is only 6% of the cost base, so it’s not critical. Others are asking for tariffs against steel being “dumped” by China. in a globally traded commodity, they are also pointless – are we to raise tariffs against all steel not from Port Talbot? As we saw when we looked at the effects of global trade on US jobs last week, the key is to retrain workers for new jobs and to use grants and infrastructure investment to replace the failing industry with a more successful one. John Authers looked at the competitive weakening of the dollar and the yen. John points out that despite a volatile first quarter, equity markets are back where they started the year. Bank shares are not, however. 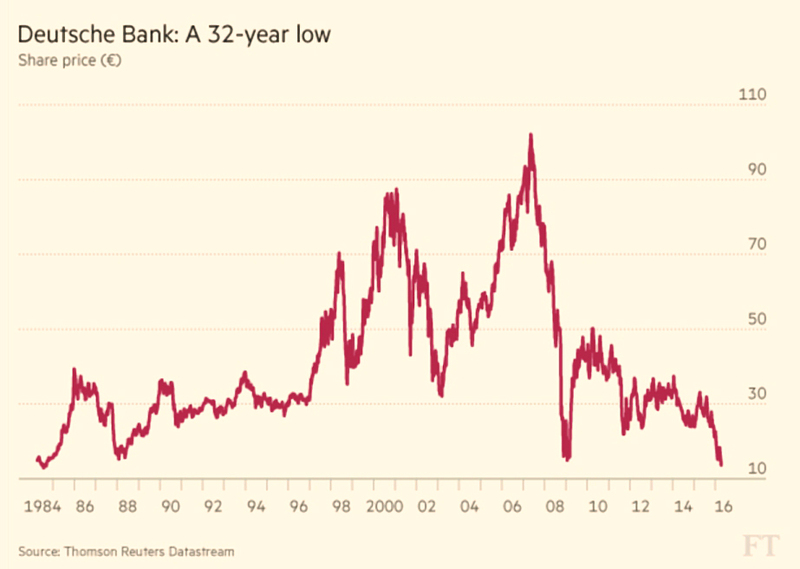 Deutsche Bank’s stock is at a 32-year low. lower than during 2008 and the scare around the bank in February. Other bank stocks are also low, driven by worries about low and often negative interest rates. These are hard to pass on to customers and so dent profitability. A consensus seemed to have emerged that negative rates weren’t working. When the Bank of Japan went negative in January, the yen strengthened rather than weakened. The dollar went down in the end because the Fed was forced to back away from its prediction of four rate rises in 2016. Japan is now signalling more currency intervention to weaken the yen. But markets are still bidding up the currency. So it will be interesting to see whether the dollar or the yen will weaken further. Schumpeter looked at the potential for ageing baby boomers to reshape the business landscape. The over 60s are the fastest growing group in rich countries, and are set to grow by a third over the next 15 years. They are also the richest group, already spending $4 trn per year. Pensioners average $39K of consumption per year, compared to $30K for those ages 30-44. Today’s old people are less interested in material possessions and much keener on experiences (travel and study). Yet few companies currently focus on this group, perhaps because marketing departments are full of young people. I certainly find it strange at age 55 that TV advertising is never selling to me. Apparently I’m not alone, if a little premature – 68% of the 65-74 age group “don’t relate” to TV ads. One problem is that 60+ covers such a wide range of customers. An 82-year-old is not like a 62-year-old. And people age at different rates, so just targeting “65-year-olds” won’t work. A third problem is that old people don’t like to be reminded that they are old. A survey found that 61% feel at least nine years younger than their chronological age, and ad campaigns that mention age are doomed to fail. But a solution will be found. The boomers have changed every age they have lived through from teenage years to the workplace. Retirement is just the next stop. Hi. Just discovered this wonderful website. Thanks for putting so much time and effort into providing such useful information. There is so much out there for the US based investor but so little for a UK based investor such as myself. Previous story What is Financial Independence and FIRE? We begin today's Weekly Roundup in the FT, with a review of the first year of the pension freedoms.